In 1987 on the Sunset Strip, a small-town girl met a big-city dreamer – and in L.A.’s most legendary rock club, they fell in love to the greatest songs of the ‘80’s. It’s Rock of Ages, a hilarious, feel-good love story told through the hit songs of iconic rockers Journey, Styx, REO Speedwagon, Foreigner, Pat Benatar, Whitesnake, and many more. Don’t miss this awesomely good time where big hair meets big dreams and the result totally wails when Rock of Ages plays the Bob Carr Performing Arts Centre, January 11 – 16, 2011. Tickets for Rock of Ages go on sale Friday, November 19 at 10 a.m. and start at $38. Tickets can be purchased at the Fairwinds Broadway Across America – Orlando Box Office, Amway Centre Box Office and all Ticketmaster locations. Online purchases can be made at www.OrlandoBroadway.com. To charge-by-phone call 1-800-982-2787. Book a group and save money, group orders may be placed by calling (407) 423-9999 or (800) 950-4647. Rock of Ages will play Tuesday, January 11 through Sunday, January 16, 2011 with evening performances at 8 p.m. Tuesday through Saturday, a Saturday matinee at 2 p.m., a Sunday matinee at 1 p.m., and a Sunday evening performance at 6:30 p.m.
Coming to you, direct from Broadway, Tony Award Nominee Constantine Maroulis of American Idol fame will reprise his acclaimed performance as Drew in the First National Tour of the five-time Tony Award nominated smash-hit musical Rock of Ages. Rolling Stone says, “Rock of Ages has found a perfect lead in Maroulis,” and so like Bartles & James, big hair and Dep, some things are just meant for each other. Rock of Ages is directed by Tony Award Nominee Kristin Hanggi (Bare, Pussycat Dolls on the Sunset Strip) and choreographed by Kelly Devine (Jersey Boys – Associate Choreographer). The book is by Chris D’Arienzo (writer and director of the film Barry Munday), the original arrangements are by David Gibbs (Counting Crows, Film: That Thing You Do) and the Music Supervision, Arrangements & Orchestrations are by Ethan Popp (Tarzan; Europe: We Will Rock You, Mamma Mia). Scenic design is by Beowulf Boritt (Spelling Bee, LoveMusik), costume design is by Tony Nominee Gregory Gale (Cyrano, The Wedding Singer), lighting design is by Jason Lyons (The Threepenny Opera), sound design is by Tony Nominee Peter Hylenski (Shrek), and projection design is by Zachary Borovay (A Catered Affair). Rock of Ages opened on April 7, 2009 at Broadway’s Brooks Atkinson Theatre to critical acclaim, following an off Broadway engagement in the fall of 2008. The Broadway production was nominated for Five 2009 Tony Awards, including Best Musical, and New Line Records released the Original Broadway Cast Recording in July 2009, featuring 28 songs from the show. A New Line Cinema/Warner Bros. film of the musical, directed by Adam Shankman (Hairspray), is scheduled to be released in 2011. Rock of Ages opened to rave reviews at the legendary Royal Alexandra Theatre in Toronto, Canada on May 11, 2010. It was also recently announced that Rock of Ages will head down under and open at the Comedy Theatre, Melbourne, Australia in April 2011. Rock of Ages is produced by Matthew Weaver, Carl Levin, Jeff Davis, Barry Habib, Scott Prisand, Janet Billig Rich, Hillary Weaver, Relativity Media and The Araca Group. 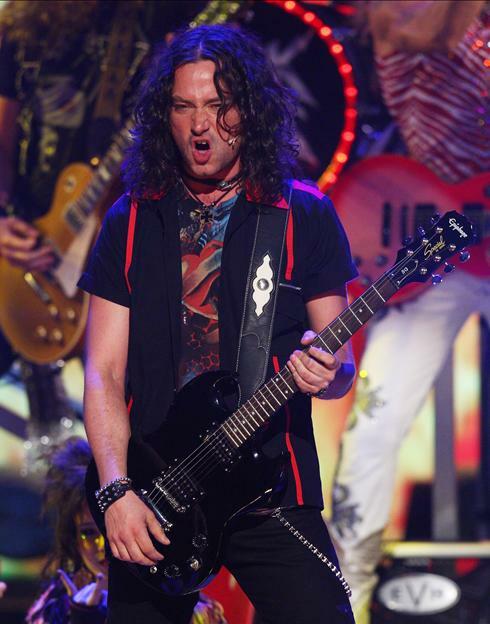 This entry was posted in Celebrities, Orlando theater, Tours and tagged Bob Carr Performing Arts Centre, Constantine Maroulis, Rock of Ages. Bookmark the permalink.